Those of you who’ve been following me on Twitter know that I’ve put together a pretty substantial dataset, and I’ve been working through the data with a metric I’ve used for a while. %TSh is a player’s shots divided by his team’s estimated shot total in games they played (Team Shots / Team GP, multiplied by player GP). The measure gives us an idea of the player’s shooting contribution to the team’s offense. It moves outside the pesky variance of shooting percentage and gets closer to a stable indicator of offensive role. I’ve done the same with %TA, which is the same equation for assists. The reason for estimated team totals is we don’t yet have good macro-data on specific games that players played before 1987-88, but the metric runs essentially in lock-step with the real thing and I want to provide a useful, historical point of comparison. Doing this allows us to look 20 years further back. 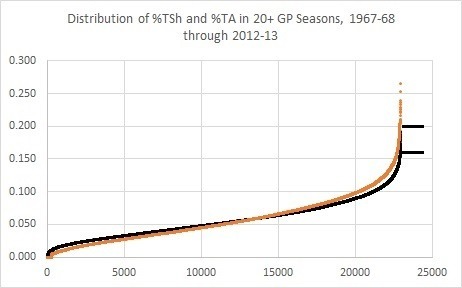 The distribution above includes over 23,000 player seasons over 20 GP; the orange distribution is %TA, and black is %TSh. I used the marks to connect back to the previous week’s bizarre flame war over Ovechkin’s value and approach to the game; the top one shows Ovechkin’s peak year, 2008-09 (20%), which also happens to be the highest %TSh of all-time. The bottom mark is Ovechkin’s 2012-13 (16.3%), which I’m using because his current season is just slightly higher – it would be good for 16th best in NHL history. 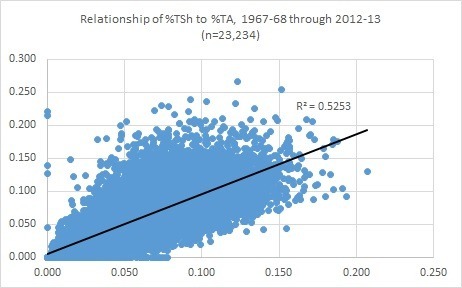 In the graph above, the x-axis is %TSh, and the y-axis %TA. Intuitively, these run together a fair amount, as shots create rebounds that can be counted as assists, and a player that shoots a lot is likely to be more heavily involved in the entire offense. That said, they don’t run nearly so close together as to render either measure moot. I think %TA can be a valuable counter-weight for assessing defensemen. Anyway, this is the tip of an enormous iceberg of data, so don’t be surprised to see me refer to and use %TSh and %TA again. Part of the reason I like doing graph work is because a good graph (with a little bit of contextual knowledge) can tell a really interesting story. In the past, I’ve been a proponent of digging deeper into the historical data, and noted that even though we have less data of the pre-BTN era it doesn’t mean we can’t make some intriguing graphs. %TSh, or % of team shots (in the games a player participated), provides a great opportunity to do just that, not just in a player’s career (as I’ve done before) but also over the course of a season. 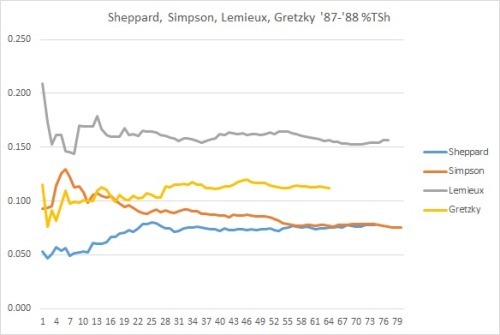 In the graph above, I took two well-known players, Mario Lemieux and Wayne Gretzky, and matched them to two (to the younger readers) lesser-known players from 1987-88, Ray Sheppard and Craig Simpson; I expressed their %TSh cumulatively, game-by-game. 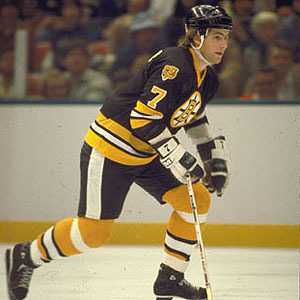 Craig Simpson, at the tender age of 20, was having the best year of his career (56 goals on an incredible 31.6% shooting percentage), but a trade to the Oilers mid-season would alter his offensive role for that season and into the future. 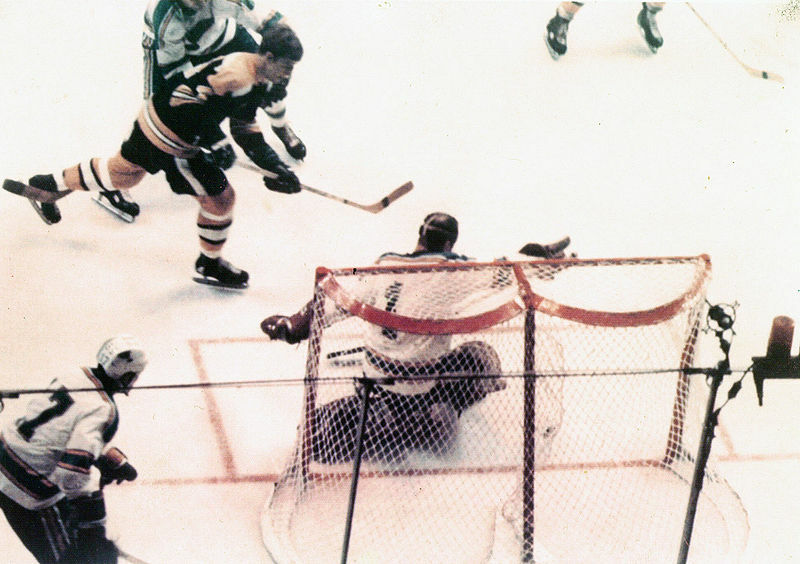 Ray Sheppard, like Simpson very young (21), over the course of the season earned Ted Sator’s trust and responded with a 38-goal rookie season. 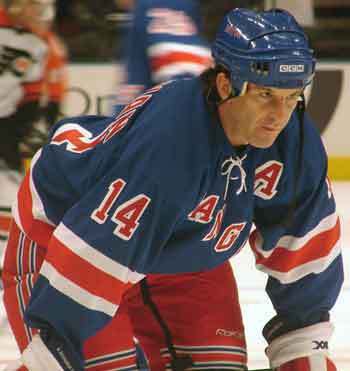 Sheppard would go on to be a very good offensive player for about a decade. Yet their lines relative to Gretzky and Lemieux also remind us that, for as good as they were, neither were driving the boat to the level of those legends (and probably wouldn’t). So you do get some perspective on what some of the best-of-the-best were doing. 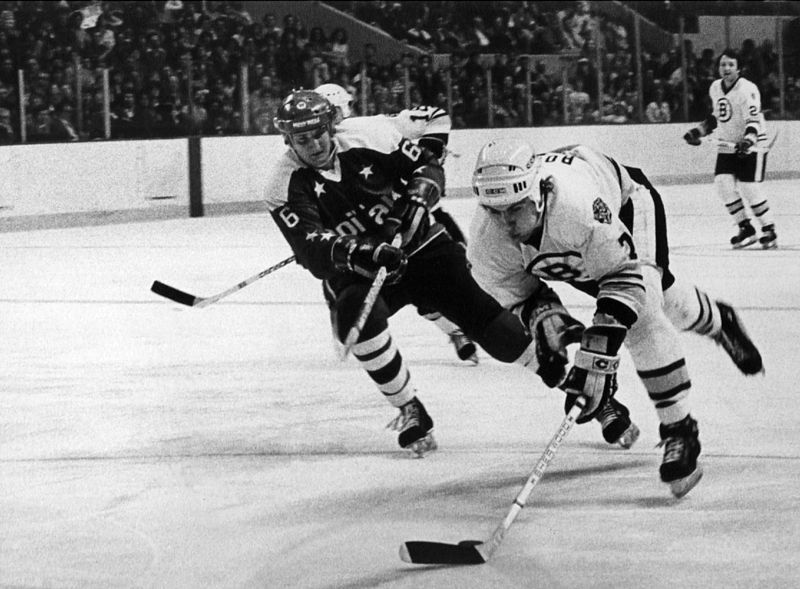 Lemieux, who was entering his prime, was literally carrying a middling Penguins team on his shoulders, and his ability to do that would bring him, in 1988-89, to convince people that Dan Quinn and Rob Brown were really good. For frame of reference, in the BTN Era (2007-08 to present) only Ovechkin has been able to come close to the kind of shot volume Lemieux was demonstrating in 1987-88. “It’s a matter of systems,” “They don’t have a good system,” “There is no system there”…we hear phrases much like this frequently, and I wonder just how much weight we give the word “system” in a game that flows and relies on instinct and reflex. Teams have some kind of system, no doubt, but it’s funny how the actions of any kind of system pale in comparison to the number of times we notice the classic breakout, setting up of the zone, or cycle. What I’m trying to say is, might we be putting too much emphasis on system, when the results are not clearly resulting in different shot quality? Might we be overstating the role of something practiced for a couple of months, maybe a year or two, versus 15-30 years of playing experience, and all the instincts, common tactics, and reflexes? In my mind, systems are important in-and-of themselves, because their organization principles are intuitive. Cover the man or take away the passing lanes, apply forecheck pressure or trap in the neutral zone…these base ideas probably need to be there to keep things from devolving into pickup hockey. And you all know that game, where everyone’s a superstar forward and nobody backchecks. Seriously, no wonder you guys can’t ever find two goalies. Anyway, with my current treasure trove of game-by-game, player-by-player data going back to 1987-88 (thanks to Hockey Reference’s excellent Play Index), I wanted to see just how much the game has evolved since the late 1980s, particularly in regards to defensemen involvement in the offense. We already know that the difference in shots-for per team, per game is 30.4 in 1987-88 to 29.1, so not a heck of a lot has changed in shot generation, and the goals/game per team has changed drastically, from 3.71 in ’87-’88 to 2.75 today. This information alone should suggest we probably haven’t improved too much in regards to what we might call offensive systems. Has defensemen involvement increased, and driven the scoring down? Have teams attempted more forward involvement to improve scoring? Will Guy Boucher ever convince us he has the key to better offense again? I took data from about 30,000 individual player performances in 1987-88 and about 26,000 in 2012-13; I compared the player’s shot totals to their team totals in those games and derived my %TSh, or percentage of team shots metric, previously used in my piece on Career Charting.